Learning a language is not easy even for those who have a natural aptitude for it. There are certain things, which every language learner can do to make the process easier and make them sound more natural when speaking the language they are learning. One of these things is to listen to recordings. Listening to people who speak the language properly is the way children learn a language, and why children whose parents speak to them in multiple languages become bilingual more easily. As it is not practical for language learners to pop over to the country where the language they are learning is spoken, to listen to recordings is often the best way to do this. There are plenty of language learning tapes and CDs on the market for you to listen to. They are available for pretty much every language you can think of, especially if they are bought over the Internet. These tapes and CDs start from basic packages with simple words and phrases for travelling recorded on them, to complete language learning programmes, such as the popular Linguaphone. Many companies who make these tapes and CDs also now back up their programmes with Internet based updates. The Internet is a great way to listen to recordings, especially if you need just one word and are not sure how to pronounce it. Listen to recordings like these and you will have the correct pronunciation from the outset. Coupled with books they can be very useful, although you will probably still need instruction form a teacher too. Listening to the recordings in the car or on your iPod while at the gym are great ways to allow the words and phrases to penetrate your mind and sink in. Another useful way to listen to recordings is to ask your teacher to make up some tapes or CDs especially for you. Your teacher will know what areas you are struggling with and where you need extra help and so will be able to tailor these tapes to you. Then they can assess you on what you have learnt from listening to the recordings in your next class. Many teachers also use recordings during their class to illustrate dialogue, which they would not be able to do as simply on their own. One of the best ways to truly embed yourself in the culture of a country, especially with regards to the language, is to listen to recordings of TV and radio programmes. This is not something beginners will find useful but once you have built up a good vocabulary and are beginning to grasp the basics of the grammar, it is a worthwhile exercise. You can find many foreign radio stations on the Internet now, and some radios will pick up at least French stations. If you live near the coast, you may even find you can tune in to French TV shows. If this is not possible, make recordings of the languages on TV and radio when you visit that country or ask people who are going there or live there to do this for you. In addition, for many of the most commonly spoken languages in the UK, a big DVD rental store will usually stock a selection of foreign language films. Rent some of these and watch them with and without subtitles. With subtitles helps you to learn the words and then watching without helps the phrases and structures to sink into your mind. Finally, an equally useful tool to those listed above is a method to help your speaking rather than listening. 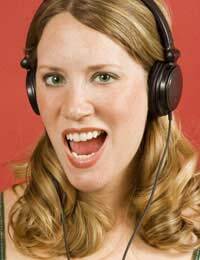 Record yourself speaking the language and then listen to recordings of yourself often. You will be able to pick up mistakes, hear where you go wrong frequently and where you stumble. You can also ask your teacher to listen to them and give you feedback. And, the recordings are always useful if you feel disheartened. Listen to recordings made a while back and feel proud at how far you have come. Listen to recordings often, and vary the ones that you use and you will see your language skills come on in leaps and bounds. There is no substitute for hearing a native speaker of the language and if you listen to recordings this is what you will be doing. They will help in innumerable ways, including improving your vocabulary, pronunciation and confidence. Do not be afraid of recording yourself either – you are the only person who has to listen to it and it will help immensely. People develop not only listening comprehension skills in English by watching English movies (films) and other programmes on video, on TV or on the Internet, or by listening to BBC English, the Voice of America and other programmes, and to audio/video recordings for learning English. People also listen to and learn different accents and peculiarities of English usage in real life settings in different English speaking countries by native English speakers in terms of pronunciation, grammar, vocabulary and style (formal and informal English). Informal English includes colloquial, slang and dialectal usage. Regular long-term listening to various authentic English audio and video materials helps a learner produce his or her own sentences more quickly and with better wording when speaking than without adequate practice in listening comprehension in English. Listening practice in English is also very important because foreign learners of English living and learning English in non-English speaking countries have limited opportunities for regular long-term in-depth oral communication in English with native speakers of English on a variety of topics and issues using comprehensive content and extensive vocabulary. And both listening and speaking content of various topics and extensive vocabulary can be included in practising listening comprehension in English (for example in listening to dialogues, discussions, debates, interviews, narrations, etc). Therefore listening will significantly contribute to development of one's speakingand pronunciation skills. It is a good idea to practise speaking and discussions of issues in English after listening to texts and programmes in English.